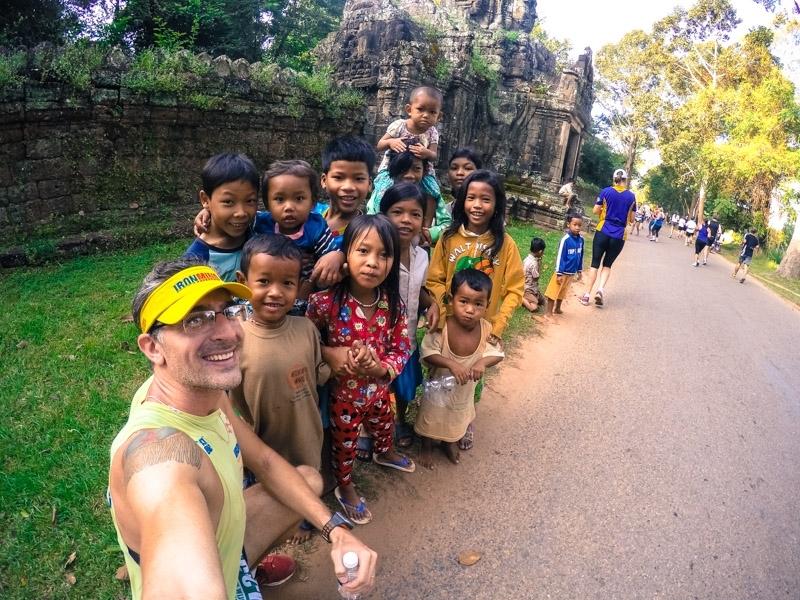 Angkor Wat Half Marathon, running in the ancient temples of Cambodia. 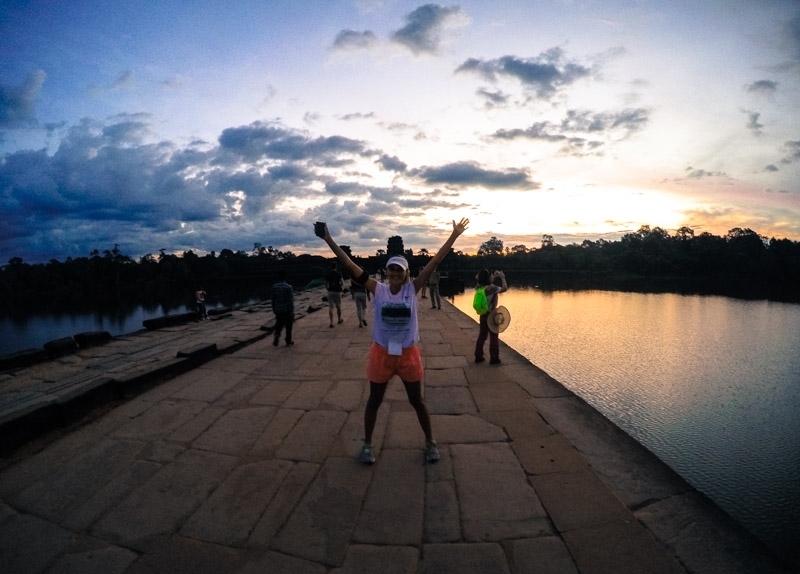 Angkor Wat Half Marathon, the opportunity to run through a millenary temple, enjoy breathtaking landscape and help charity institutions. The tough side is to keep the pace running in such a beautiful place. 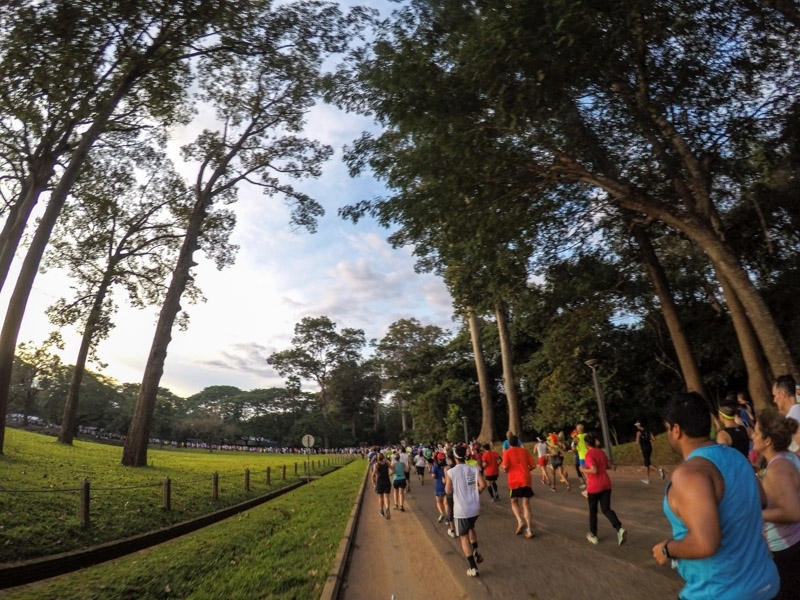 The Angkor Wat Half Marathon is growing year after year. Thousands of athletes from all around the world travel to Siem Reap, Cambodia to be part of this event. 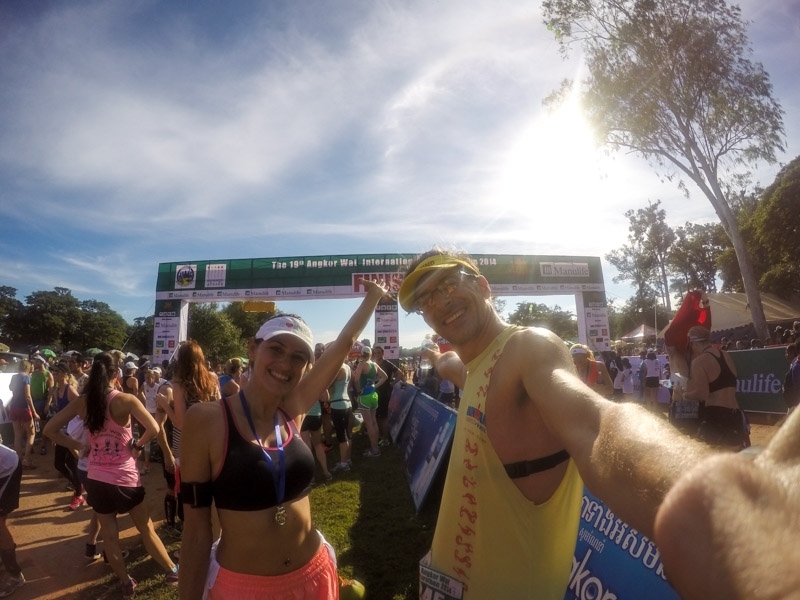 The 2014 edition gathered about 5 thousand runners and Natalie and I were there. She went for the 10k and I for the 21k distance. There is also a 3k “fun run”, with a lot of kids running this distance. We arrived in Siem Reap, Cambodia 3 days before the race. Our plan was to visit the Angkor Wat Complex and enjoy the worldwide famous, Angkor Wat sunrise, before the competition. Also arriving a few days in advance helps the body get used with the heat and humidity. Now my advice, leave to visit the Angkor Wat complex after the race. The place is huge, you walk a lot, climb a lot of stairs, it is really tiring. So it is better to arrive about 3 days in advance and just relax at the hotel. We recommend at least 2 days to visit Angkor Wat, but if you really like history you can easily spend a week there. The race starts at 6 AM, you should organise your transfer from the hotel to start area one day in advance. We hired the same Tuk Tuk driver for the tours and to take us to the race. At 4am sharp he was at the lobby, I thought that it was too early but as soon we hit the road I was glad that we left so early. Crazy traffic and a lot of people on the start area, it was a bit hard to find a good spot. The bad guy on this race is the heat, it was about 5:30 AM and I was already sweating. You have to take a special care on hydration. Since the race starts in front of Angkor Wat Temple we could enjoy one more time the Angkor Wat sunrise. Seriously one of the most beautiful sunrises I ever saw. One advantage is that the whole course is flat, if we have some hills plus the heat them this competition would kill me. Also most of the course is lined with huge trees which provide a well deserved shade. 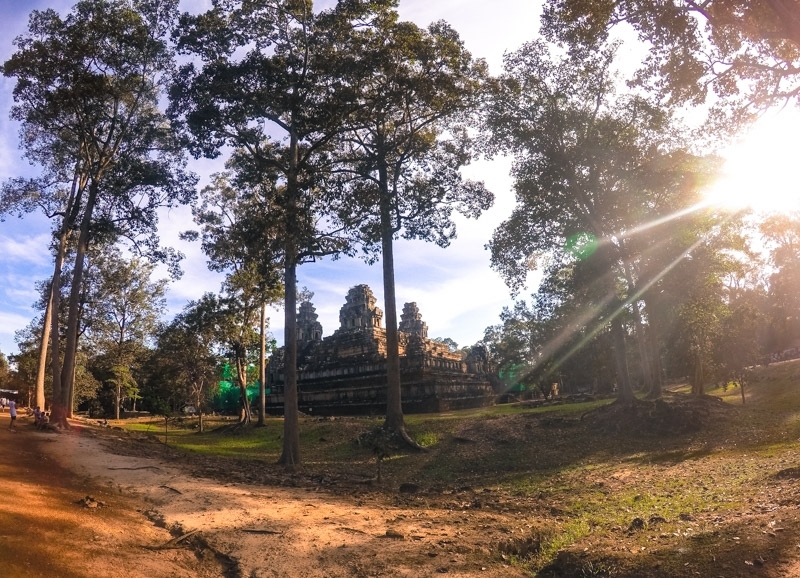 The race starts at Angkor Wat Temple and goes towards Prasat Kravan, Barneai Kdei, Ta Phrom, Ta Keo, Victory Gate, Elephant Terrace, Bayon Temple, South Gate, Basei Chamkrong, Phom Bakheng and reaches again Angkor Wat. The race is really well organised, different starts for the different distance(21k, 10k & 3k), hydration stations with water every 2k, isotonic at 9k, 14k, 16k, 18k and 20k, banana at 6k, 10k and 18k. WC at 9k and 20k. The marking in the whole course and around the start/finish area was perfect, the total distance was accurate, matched with my GPS. One funny thing that I saw during the race happened near one aid station where they were giving bananas. As some athletes just run by they couldn’t manage to get the bananas which fell on the ground, suddenly coming out from nowhere some monkeys grab the bananas and run into the forest. They were way faster than the athletes! This competition was kind a “luxury training” for me. I was getting ready for the Paris Marathon that happened on April 2015. I wasn’t worried about time and as this was my first long distance competition since my hip`surgery on 2013, I need to take it easy. The plan was to run at a comfortable pace up to 17k, if all fine I could speed up a bit. 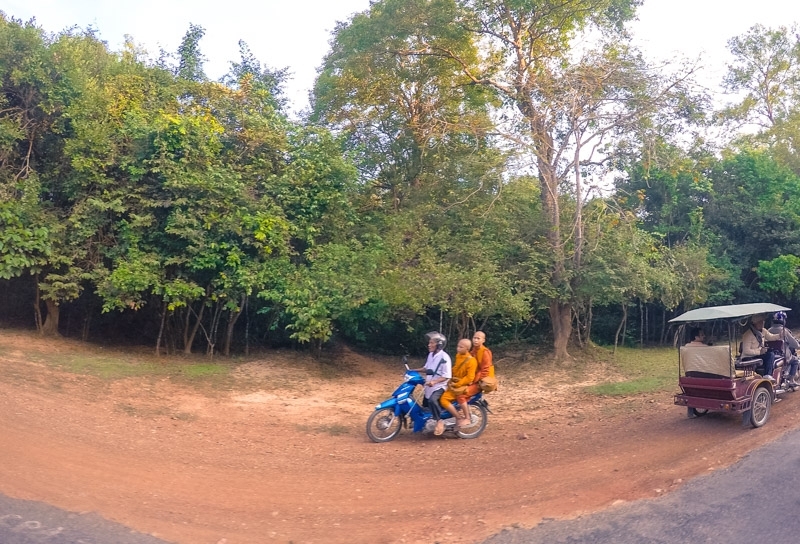 So I didn’t miss any opportunity to stop to take pictures of the temples, elephants, monkeys, the kids cheering, monks… This is a unique race with an incredible vibe. With all the stops, I finished the Angkor Wat Half Marathon in 2 hours and 19 minutes. Who did really well was Natalie, she finished the 10k in 1 hour and 2 minutes, she got the 92 position among 1012 runners! 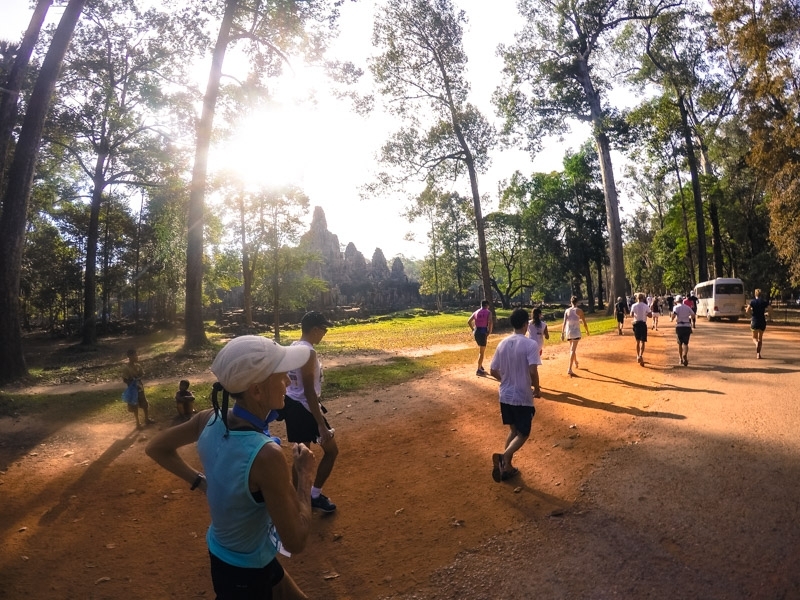 » Hotels for the Angkor Wat Half Marathon in Siem Reap, Cambodia. If you want to splurge and treat yourself, book your stay at Shinta Mani Resort, it’s known as the best hotel with the best staff in Siem Reap. For a midrange hotel you can try the stylish Angkor Pearl Hotel, for less than USD 30 you can get a beautiful and comfy room. The option for the hostels fans is Mad Monkey Siem Reap, a great staff, comfy rooms and they do a great work supporting the local community. Win win all around. 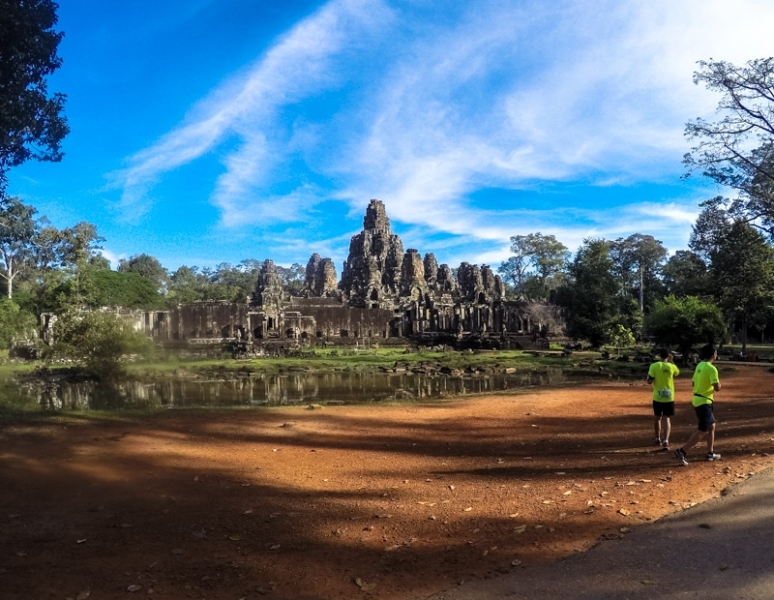 » How to get to the Angkor Wat Half Marathon Siem Reap, Cambodia. The easiest way is to fly. 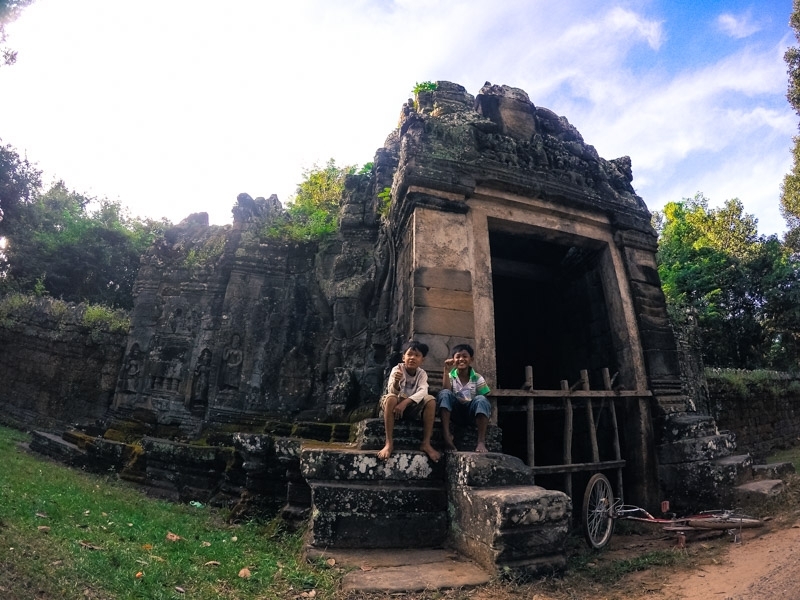 From Bangkok, Singapore or Kuala Lumpur you can reach Siem Reap. Or you can fly to the capital, Phnom Pem and them get a bus. If you want to save money you can board a bus in Bangkok, it’s about 10 hours trip. The bus journey from Bangkok to Siem Reap is quite tiring, the traffic is crazy and the drivers are mad. To make it worst the Immigration officers at the Cambodian border will demand a bribe to give you the VISA. We crossed this border twice and on both times they charged an extra USD 5 from every single passenger. On our second time we refused to pay and the officer held our passport for about one hour, the bus was waiting only for us and after a lot of talk they gave us the Visa. Unfortunately, our first impression of Cambodia was awful. Lonely Planet guides about Siem Reap and Angkor Wat, Cambodia. My sports equipment for the Angkor Wat Half Marathon: I used my Garmin Forerunner 310 XT and my New Balance 890 V4. So, fly to Siem Reap a few days before the Angkor Wat Half Marathon, get used with the weather, treat yourself in a nice hotel, enjoy your race day and after that take a few days to explore the temples of Angkor Wat. I’m sure you will have a great time on this competition! 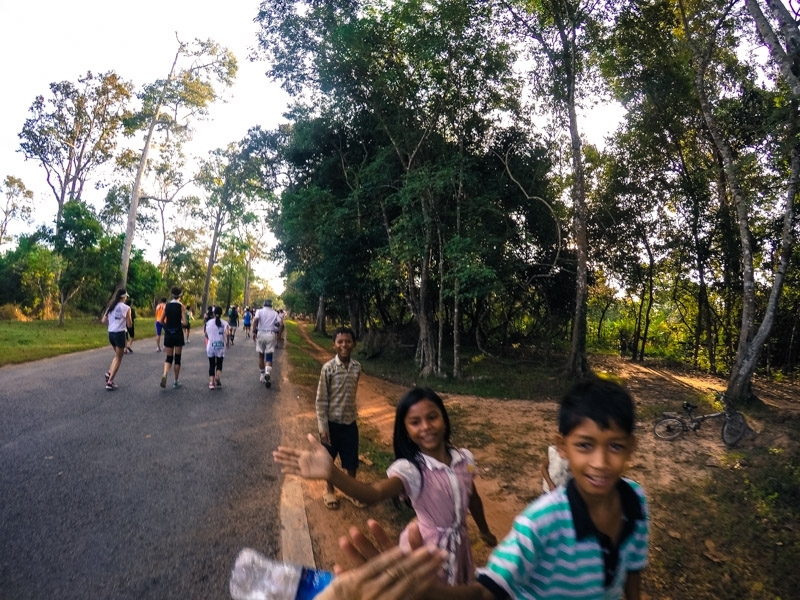 Did you run the Angkor Wat Half Marathon? Or any other competition in a unique place? What an incredible experience – despite the heat. And am so impressed by how well you and Natalie did! I am not much of a runner but if it meant spending time in this beautiful location I could be tempted, although I think I would need to start with the 3k run and join in with the kids. Angkor Wat is incredible beautiful! Running in that heat sounds intense. However, getting to see the temples, elephants, monkeys, etc., makes it exciting. Nice going with the marathon Natalie, 92nd out of 1012. Congrats guys. Yes, Nat did really well! I remember the heat and humidity from even now… and I last visited 10 years ago! A massive congratulations to anyone who can run the half marathon in those conditions, although of course, the surroundings are awesome! For sure the surroundings helped to cope with the heat. Tks! It was a great experience indeed! It was a great great race! COngratulations for thsi incredible experience. There cannt be a better place to run marathon. Loved it. For sure it was a stunning location! What a great place for a marathon! I am not a runner, but this looks appealing (minus the heat)! It was an great challenge Tarah, but the view make up for the heat! It sure is an incredible place and I can’t wait to visit it. I’m just starting to really get into running so when we were in Siem Reap this wasn’t on my radar at all. Now that I know this exists I’m very interested in doing this myself! Great job guys and well done! We try to run as much as possible during our trips, sometimes is hard to find places to run or training but in other hand we find amazing competitions worldwide. So far Angkor Wat was one of the most beautiful races!! Next challenge will be the Chiang Mai Half Marathon, north of Thailand by the end of December!! All the best and thanks for stopping by! When we did this we came from training in South Korea which was freezing cold to the hot, humid weather! I had difficulty adjusting to the new climate as well as the new food during the race! You guys did great! That’s really cool you did the marathon in Paris as well! Thanks for sharing! Perhaps we should sign up for another somewhere else around the world! Our acclimatisation was easier since we came from Chiang Mai. Even though the heat was tough.